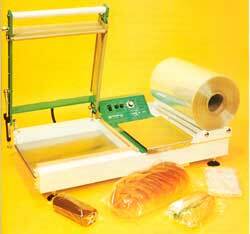 The Bakerpack L sealer provides the ideal solution for all those 'small' packaging jobs - snadwiches, filled rolls, packs of rolls, cakes, bread. Air cylinder counter balance which allows effort free up & down head operation. Rotaring Teflon guards to minimise fumes. Pack Table & Film Carrier. Rapidly slides in & out to give maximum versatility across the product range. Will take up to 420mm wide film. Narrow films can also be used to maximise efficiency and minimise cost. 5 height positions allow for effective packing of a product range. Specification: Length 800mm Width 460mm.